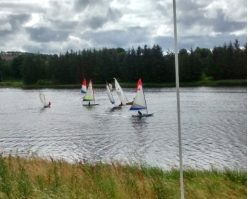 Welcome to Forfar Sailing Club! Our club is situated in the centre of a country park with a variety of wonderful wildlife, spectacular views, contrary winds but superb and interesting sailing. We trust you will find the sailing challenging, the company stimulating and the winds? Well . . . contrary! We hope that this information helps you to come on board with our club and that you will enjoy sailing with us. Should you require further information or have any special requests please contact the Commodore or any member of the committee.